Long Live the King is the debut album for the Texas-based melodic death metal band Exalt the Throne, and I for one am hoping it is the beginning of a long life for this band. Musically, this album is solid, filled with old-school death metal riffing, shredding solos, and steady drumming to bind the whole structure together. Vocally, the band employs the “beauty and the beast” style, contrasting Kanyon Loyd’s growls with the classically-oriented vocals of band newcomer Courtney Johnson. One of the musical highlights of the album is “Something Brutal This Way Comes” for the way the music and the vocals meld together with Johnson’s vocals soaring above the riffs and growls, creating a lot of space for all the voices and instruments. The title track features Johnson harmonizing with herself, which is a nice musical effect. Overall, again, this is a great album that really delivers in its melodic brutality. 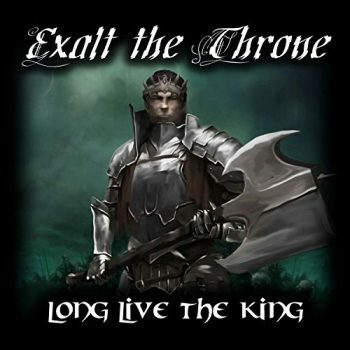 I am excited to hear what the follow-up to this album sounds like, because in my opinion, Exalt the Throne is poised to make a lot of noise in the Christian metal world and beyond. Then he said to them all: Whoever wants to be my disciple must deny themselves and take up their cross daily and follow me.